How are you? Olsem wanem? How much is this? Hamas long hemia? Thanks to Eddie & Joseph Etul for the voices used here. 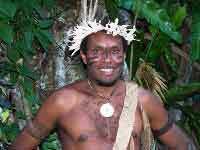 Ni-Vanuatu people come from the 82 islands of Vanautu and speak a total of 113 languages. With a population of only 252,000 people, this makes Vanuatu the most language-dense country in the world.